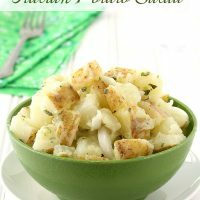 Introduce a new potato salad possibility to your picnic table with Italian Potato Salad – russet potatoes tossed with olive oil, vinegar, onion, garlic, and parsley. Potato salad – such a classic side dish to serve at picnics yet there are so many ways you can dress it up. I’m guessing you are familiar with mayonnaise-based potato salads and even Amish potato salad with mustard, but what if I told you one of the best ways to make it involves olive oil? For the past few years now, Dad makes his Italian Potato Salad for cook outs, a recipe he learned from his mom and then passed it along to me. Now I’m passing it along to you for your next picnic. I made my potato salad slightly different than my dad. First, I added garlic and parsley pastes, which you can find both in your store’s produce section by the fresh herbs. Using pastes distributes the flavors more evenly in the dressing; however, you can use minced garlic and chopped parsley if you don’t have the pastes. Or you can make your own pastes. Since you’re using olive oil as a dressing rather than a cooking oil, you want to use the best quality you can afford. I highly recommend not using vegetable oil as a substitute. In fact, don’t substitute the olive oil at all, but if you must, make sure you use a flavored oil. Now it wouldn’t be a potato salad without talking about the star of the dish – the potato! The potatoes I used are russet potatoes straight from Idaho. They have a low-moisture content, which gives them more potato flavor. Make sure you cook them on simmer and not at a full boil. Otherwise they will disintegrate before fully cooked through. Bring a large pot of water to a boil. Add the potatoes and cook 10-15 minutes until soft but not overcooked. Drain and cool. In a large measuring cup, whisk together the olive oil, vinegar, parsley paste, garlic paste, and salt. 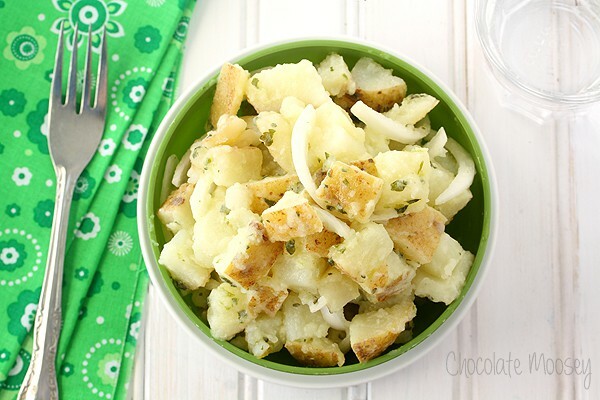 In a large bowl, toss together the potatoes, onion, and olive oil mixture. Chill in the refrigerator at least 1 hour before serving. I love that this recipe is not for a giant batch of potato salad. It will be just right for making it any day for the 2 of us (with a little leftover for lunch the next day too). Yes I hate having TONS of potato salad leftover but always want just enough to have for lunch the next day. Yum! 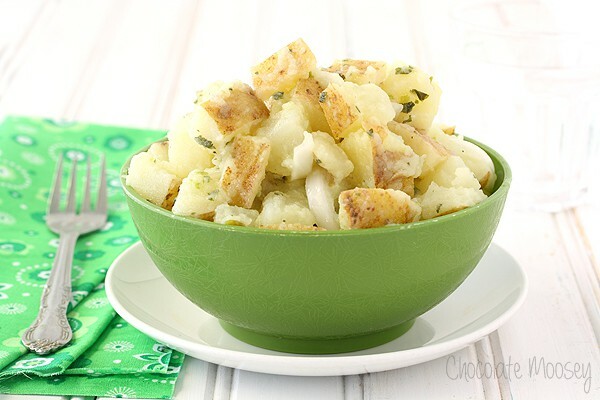 This is such a simple and delicious potato salad! Love the flavors you used! Thank you for all the nice recipes. Have a Great Week! This is my type of potato salad! Feels like what you’d get in a mayo based one but with olive oil instead! Exactly! I love oil and vinegar in general, so the mayo was not missed. Yummy…I love how simple and refreshing this is! Can’t wait to try it, Carla! This is my kind of potato salad! Looks amazing. Oh I am in love with this! Yummo! Perfectly simple and delicious! Love the addition of garlic and parsley. Kudos to Dad for this yummy Italian-style potato salad, Carla. The touch of olive oil and garlic paste is brilliant! love this tasty, fresh and flavorful spin on potato salad with the garlic and parsley pastes!!! brilliant! i love your potato salad version. Sounds fantastic! This is so simple, but I can just tell that it packs a ton of flavor! I’m beginning to think that all I’m making for dinner today is a variety of potato salads…this one included – yum! Agreed! A whole picnic dedicated to potato salad alone. This is such a great idea. Using olive oil with garlic and parsley pastes is a great picnic option! I love the idea of using the garlic paste to evenly distribute the flavor. So smart, because that’s one of the reasons I’ve shied away from using garlic in potato salad – some bites would be really garlicky, and others would have none of that flavor at all. Problem solved! I won’t eat mayo-based potato salads, so this one looks like a perfect substitute! I love how simple yet full of flavor this salad is…and it looks pretty too! The garlic paste and parsley paste surprised me…but in a good way. Very smart! Yes the pastes help distribute the flavor more evenly. Nothing wrong with minced garlic and parsley, but I prefer the pastes myself. This is exactly the kind of potato salad I would want to eat. No mayo, lots of beautiful herb flavor, and simple to make! I love Italian anything and this sounds delicious! 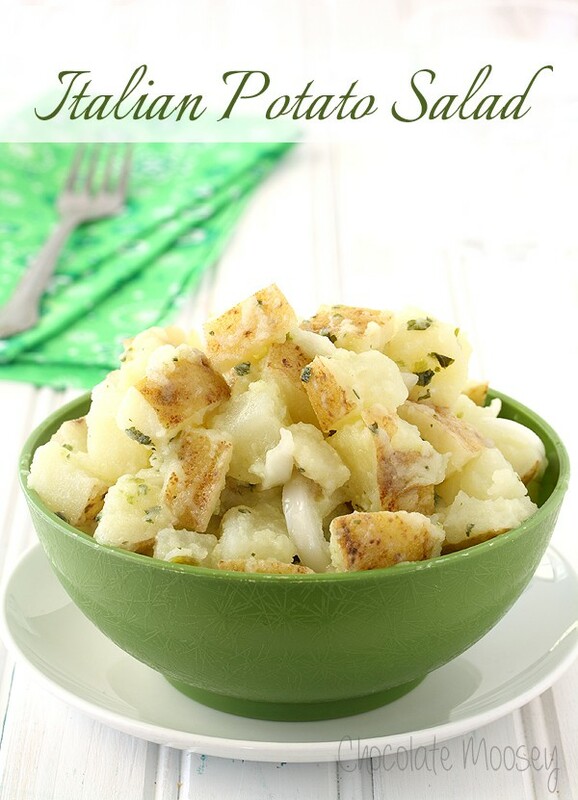 This potato salad would be a big hit with my husband! Italian flavors and seasonings are his favorite! Wow! I just made potato salad this weekend. I wished I had seen this recipe. where I took it would have been an excellent place and group of people to appreciate something new and different. I am actually anxious to see how this tastes! Not being a huge mayo fan, this a potato salad I can get behind! We have been making this salad for years in my family especially in the summer . We especially love it with the addition of tomatoes and oregano. Try it – it’s delicious! Oh tomatoes – I will have to add halved cherry tomatoes when they are ready this summer! This is definitely the way I like to enjoy my potato salads – lightly dressed without mayo! YUM! Can I just pull up a chair at your table and you feed me all your tater dishes? Yes? Thanks! Duuuude! Pass the taters, please! oh my goodness – people have left-over potato salad? I has never happened to me personally – cuz I eat it all! just recently I was remembering back when – a long long time ago – far away – I used to live in Joplin, Mo and had the pleasure of going just over the state line for some Wonderful eats – Chicken Mary’s and Chicken Annie’s… whew – how I would love to go there again – but would rather just make that potato salad— and sounds like your recipe is just what I’m looking for – thank you so much – will let you know when I accomplish this!!!! Ha! I tend to eat a lot of it too, especially with this Italian version. Hope it’s what you’re looking for!